Baical Skullcap, Scutellaria baicalensis, is also known as Golden Root, Huang-Qin. Baical Skullcap is an attractive plant whose medicinal action sometimes resembles Goldenseal. Traditional use of roots (Huang-qin) in China are as an external remedy for boils and herpes. Highly regarded for its anti-viral, antibacterial and fever-reducing effects. In North America the roots are currently used internally as a remedy for allergies, attention deficit disorder (ADD), chronic fatigue syndrome and stress. 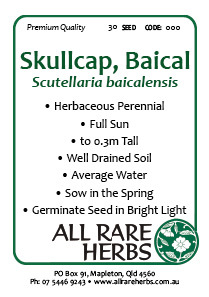 Baical Skullcap is native to eastern Asia and prefers a medium well drained soil in a sunny position. Produces spikes of purple blue flowers in summer. Frost and drought resistant. A perennnial plant growing to 0.4m x 0.3m. Be the first to review “Skullcap, Baical, seed” Click here to cancel reply.